Now, you no longer need to worry about which adhesive or solvent cement will make the strongest, most attractive finished products. Whether your application calls for strength, weather resistance, clear seams or quick set, Scigrip has the right WELD-ON product to fit your needs. Scigrip Weld-On products are intended for use by skilled individuals. We urge users to verify by tests that these products, as well as the recommended methods, are suitable for the materials being used in their application. Product Bulletins, Material Safety Data Sheets and product label information should be read before using our adhesives. Capillary cementing is probably the most popular way of joining acrylic sheet. It works because of the ability of low-viscosity solvent-type cement to flow through a joint area by capillary action. Properly done, capillary cementing yields a strong, transparent joint. * Refrigeration is recommended to maintain shelf life. WELD-ON 3: Non-flammable, water thin, very fast setting solvent cement for acrylics. Also bonds styrene, butyrate and polycarbonate to themselves. Will not bond to cross-linked acrylics. 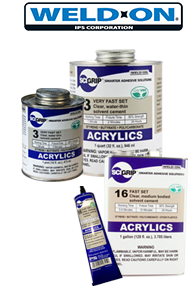 WELD-ON 16: Fast drying, high strength acrylic cement. Also bonds styrene, butyrate, polycarbonate and other plastics and porous surfaces.